Below you will find our list of the best washing machines with reviews on each model. At the bottom of this article you can find a spec chart comparison for all the machines on this list. Washing machines are considered one of the most important and time-saving appliances you can have for your home. There are two main types of machines – front-loading or top-loading. Front-loading models tend to cost more and wash clothes slower, but are far more energy and water efficient, many can stack a dryer directly on top of the unit, and usually wash your laundry better. Top-loading models normally cost less and wash clothes faster, but use more energy and water, are not stackable thus taking up more space, and usually do not perform as well. Some things you should look for in a new washing machine include the overall washing performance, the capacity, low noise and vibration, a variety of controls including automatic dispensers and temperature controls, steam setting, stainless steel tub, and a good warranty. One other important thing you should consider is the service you get from the store you buy your machine from. Some retailers will just deliver your new appliance and it is up to you to hook it up and get rid of your old one. So you should always ask some questions like do they have free delivery? Will they install and set it up for you? Will they remove your old machine for free or do they charge more for this service? 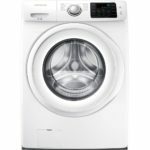 We looked at over 50 models and took under consideration the price, performance, and other user/consumer reviews to come up with our list of the best washing machines which we review below. The prices listed were the best sale price we could find at time of publication. With these appliances you should always look for sales to get the lowest price. For the best washing machine we chose the LG Signature WM9500HKA. While it is the most expensive model on our list at around $1798, it is the largest capacity washer in its class at 5.8 cubic feet and has every option available to tackle any laundry problems – including steam technology, allergenic cycle, and wash settings from heavy duty to delicate. The large capacity means you can wash a king size comforter and still have room for the rest of the bed sheets in a single load. The Signature WM9500HKA is also one of the most quiet and lowest vibration washers you can buy. The runtime is quite long, however, at two hours. That can be reduced to 90 minutes if you use the TurboWash setting. You might not think that technology would matter on a washing machine, but this model makes it a true highlighting feature. It can monitor your wash remotely through an app, with NFC you can download new wash cycles from your smartphone, and with SmartDiagnosis it can diagnose problems with the machine. The LG Signature WM9500HKA is perfect for anyone who simply wants the best of the best regardless of price or anyone who needs the highest capacity available. Buyers should be aware that this unit is not stackable and is also quite large at 41″ x 30″ x 34″. The matching gas dryer is the LG DLGX9501K and the matching electric dryer is the LG DLEX9500K. 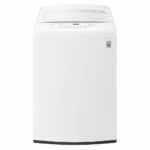 The LG WM9000HVA is one of the most expensive washing machines on our list at a sale price of $1198, but it is significantly cheaper that our number one choice and it also has one of the largest capacities at 5.2 cubic feet. Overall the WM9000HVA has superb cleaning performance while also being one of the most water and energy efficient units you can buy. The LG WM9000HVA has nearly every feature you could possibly want on a washer like auto-dispensers, auto temperature control, and steam cleaning. The normal wash time with a heavy-soil setting takes about 105 minutes, however if you need clean clothes fast you can use the SpeedWash cycle which can have a small load of clothes clean in just 15 minutes. One slight negative is that the door is not reversible and only opens to the left which means you need to have the washer placement to the left of your dryer. The LG WM9000HVA is also not stackable. You should consider the LG WM9000HVA if you need a large capacity washer with superior cleaning performance and do not mind the expensive price tag or need stackable units. The matching gas dryer is the LG DLGX9001V and the matching electric dryer is the LG DLEX9000V. 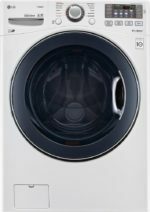 The best washing machine under $1000 goes to the Electrolux EFLS627UTT which can be found on sale for around $998. Many comparison tests have shown that the EFLS627UTT is simply better than other washers at removing deep, tough-to-remove stains. In fact, in most tests it blew the competition away. This 4.4 cubic foot capacity Electrolux model comes with 9 wash cycles including a steam cycle and 15 minute fast wash. It also has what it calls SmartBoost technology which premixes detergent with water separately then shoots that into the tub, thus creating a more even distribution of the detergent. Overall the Electrolux EFLS627UTT is perfect for anyone who needs the absolute best cleaning ability available to get rid of truly filthy stains. On the downside, it can be a bit rougher on fabrics and the general reliability of Electrolux as a brand is not quite as good as LG or Samsung, although this model seems to hold up quite well. It also is one of the few washers with a door that is reversible and the unit is stackable. The matching gas dryer is the Electrolux EFMG627UTT and the matching electric dryer is the Electrolux EFLS627UTT. 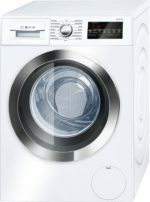 Another washer that we would not hesitate to recommend to all buyers is the $990 LG WM3770HWA. Overall this machine is efficient and a very effective washer with some quick cycle times. With 11 wash cycles including sanitize and allergen settings it can also handle any washing task you need. The LG WM3770HWA has 4.5 cubic feet of capacity and a speed wash setting that gets lightly soiled loads done in just 15 minutes. It also has some smart features as well, like downloading new cycles and smart diagnostics which help you find and fix problems. We think the LG WM3770HWA is great balance of price vs performance, while being reliable and convenient. It really has no great weakness that we could find, although LG’s customer service is known to be relatively poor. The matching gas dryer is the LG DLGX3571W and the matching electric dryer is the LG DLEX3570W. 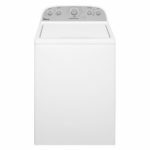 The $848 Maytag Maxima MHW5500FW scored some of the highest ratings by the leading consumer magazine in cleaning, water efficiency, and energy efficiency. This 4.5 cu. ft. front load washer has 10 wash cycles with a max time of 70 minutes on the PowerWash cycle and about 45 minutes for a normal cycle. That is the fastest cycle time for a front-loading washer on our list. It also has a Fresh Hold option which will keep your clothes fresh for 12 hours by tumbling and fanning loads that are left in the machine. 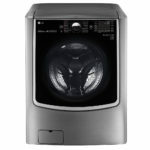 We could not find any major flaws in the Maytag Maxima MHW5500FW, so we recommend this washing machine for all buyers. The matching gas dryer is the Maytag MGD5500FW and the matching electric dryer is the Maytag MED5500FW. The $798 Samsung WF45K6500AW has a capacity of 4.5 cubic feet and provides excellent cleaning, water efficiency, and energy efficiency. It has 14 wash cycles including a steam wash and is one of the most gentle washers available on your delicate clothes. Perhaps what sets this washing machine apart the most is the AddWash feature which lets you add a stray garment through a small door on the front after a wash cycle has begun, although you still need to stop the cycle first. The WF45K6500AW also offers some control via the Samsung Smart Home app which can detect problems with your washer and perform an immediate diagnosis. With no major negatives, we highly recommend the Samsung WF45K6500AW especially if you do not need a larger capacity of 5 cubic feet or more. The matching gas dryer is the Samsung DV45K6500GW and the matching electric dryer is the Samsung DV45K6500EW. The $808 LG WM3500CW scored the highest rating and was selected as a Best Buy by the leading consumer magazine. It received high marks for washing performance, energy efficiency and water efficiency. However, the gentleness on fabrics was just average. The LG WM3500CW has a capacity of 4.5 cubic feet, 10 wash cycles (although, no steam cycle), and a normal cycle time of 105 minutes. It can be controlled remotely by an app and even works with Amazon Alexa and Google Assistant. One common complaint from some users was that the control panel is too dark and it can be hard to see which selections you are making. This machine is stackable. The matching gas dryer is the LG DLG3501W and the matching electric dryer is the LG DLE3500W. 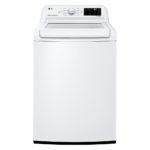 We chose the $748 LG WT7500CW as the best top-loading washing machine. This high-efficiency (HE) model is very water efficient for a top-loader and energy efficient. It is an effective cleaner, but not quite as good as the top-tier front-loading washers. The LG WT7500CW has a large 5.2 cubic feet of capacity, 12 automatic cycles, and 5 temperature settings. It has a normal cycle time of 80 minutes, but that can be cut down to 40 minutes with the TurboWash setting turned on. Overall we recommend the LG WT7500CW to anyone who wants a top-load washing machine. This machine is not stackable. The matching gas dryer is the LG DLGX7601WE and the matching electric dryer is the LG DLEX7600WE. The LG WT7100CW received the highest score for any top-loading washing machine from the leading consumer magazine. Selling from around $630, this model has capacity of 4.5 cubic feet. Much like the WT7500CW it is surprisingly efficient in both water use and electricity for a top-loader. The washing performance is good thanks to a New Motion Technology that simulates an agitator effect, without the same amount of wear and tear on your clothes that that normally causes. 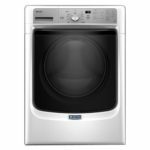 The LG WT7100CW has 8 wash cycles and 10 other settings/options. The biggest difference between the this model and the WT7500CW is the smaller capacity and lack of TurboWash setting. Without that setting, normal cycle time is 75 minutes. This washer is not stackable. The matching gas dryer is the LG DLG7101W and the matching electric dryer is the LG DLE7100W. We picked the Bosch 800 Series WAT28402UC as the best compact washing machine. This 2.2 cubic feet capacity machine sells for about $1300. 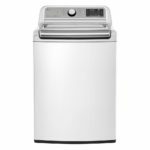 If you do not have a lot of room and need a compact washer then this one is ideal due to its size of 34″ x 24″ x 26″. It excels in energy and water efficiency and time it takes to wash a load of laundry which is about 60 minutes on a heavy-soil setting. While the WAT28402UC is also the quietest washing machine on our list, it can be prone to some vibration. The overall cleaning ability is really good, but quite up to par with the best models especially since it does not have automatic temperature controls or a steam option. At this price buyers should only consider the Bosch 800 Series WAT28402UC if space is a limiting factor in what machine you can use. The matching electric dryer is the Bosch 800 Series WTG86402UC. The $598 Samsung WF42H5000AW is the best cheap front-loading washing machine. Over the last few years it has been one of the best selling washing machines at Home Depot, Sears, and Best Buy. Despite a much cheaper price tag this machine scored equally as impressive grades in terms of cleaning capability to the top-rated units. This 4.2 cubic feet capacity model has 8 preset wash cycles, however it is lacking a steam clean option. We have seen some complaints about vibration issues, which is not uncommon among some cheaper washing machines. 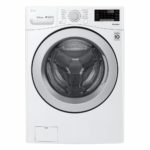 Overall the Samsung WF42H5000AW is a really solid machine for this price when it is on sale and we highly recommend it to anyone who needs a more affordable washing machine. It is also stackable. 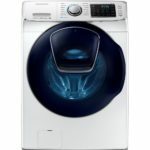 The matching gas dryer is the Samsung DV42H5000GW and the matching electric dryer is the Samsung DV42H5000EW. 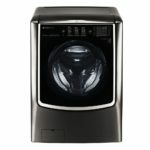 Our pick for the best washer under $500 is the top-loading HE LG WT1501CW which sells for about $498. This LG model also was chosen as a Best Buy by the leading consumer magazine for top-loaders. It is pretty efficient for a top-loader, although it receives a bad grade for gentleness on fabrics. While the overall cleaning ability does not compare to more expensive models, it can remove all but the most difficult stains. There is plenty of capacity with 4.5 cu. ft. of space. The LG WT1501CW also has 5 temperature settings and 8 wash cycles including a SpeedWash cycle which can wash small loads in just 15 minutes. The controls of the WT1501CW are located on the front of the unit which is unusual for a top-loading machine. If you are looking for a washing machine that costs less than $500 then the LG WT1501CW is for you. The matching gas dryer is the LG DLG1502W and the matching electric dryer is the LG DLE1501W. The Whirlpool WTW5000DW is the best selling washing machine at Home Depot. Selling for $498 this top-loading washer has 4.3 cubic feet of capacity. This HE model uses a low-profile impeller to wash clothes, although the cleaning ability of this machine is just average. However, it is surprisingly gentle on fabrics for a top-loader. 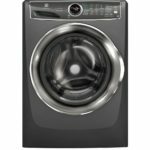 The Whirlpool WTW5000DW has 12 wash cycles and with the Quick Wash cycle it can wash small loads in as few as 28 minutes, although the normal cycle time is 55 minutes. One negative is that this machine is not energy star rated, which means it will cost more in terms of energy and water over the life of the washer. Overall the Whirlpool WTW5000DW is another solid choice for an affordable washing machine that cost less than $500. The matching gas dryer is the Whirlpool WGD5000DW and the matching electric dryer is the Whirlpool WED5000DW.